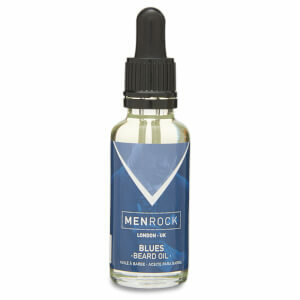 Beards are meant to be thick, and you can ensure your beard is thick by using Men Rock Beard Oil - Blues. Featuring Vitamin E oil, this beard product helps nourish your skin and beard. Follicles are also conditioned and softened, making your beard healthier. This oil also acts as light cologne and it contains many essentials such as cypress, grapeseed oil and vetivert. Directions for use: Place small amount of beard oil on your palm and massage it evenly through your beard. Repeat these steps every day until your beard is full and soft. My beard was starting to get a bit unruly so I wanted something to help tame it and help with some skin irritation and soften the hair a little. This definitely helps with the skin and keeps the hair in place, but it doesn't really soften up the hairs much, leaves them a little crunchy actually. Quite a nice fragrance in the oil, not strong at all.